Although an attorney is essentially employed by his or her client, there are certain responsibilities the client has to take on in order for the relationship to work. • Respect your lawyers time and schedule. • Trust your lawyer. Be completely honest about all facts in your case, whether or not they are favorable to you. Tell your lawyer everything. No attorney wants to be blindsided by a client. 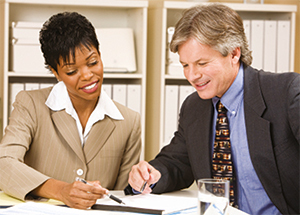 • Be cooperative with and responsive to your attorney. • Be a strong, honest and dedicated partner. • Ask questions when you don’t understand; speak up when you disagree. • Be on time for appointments. • Provide requested information promptly. • Follow through on what you agree to do. • Be available to your lawyer and attend legal proceedings, as requested. • Keep your lawyer fully informed of any new developments that might affect your matter. • Listen carefully to their advice. • Know that your attorney will not be expected to make major decisions about your legal matter. As the client, you are responsible for making the decisions on objectives to be pursued in your case, including the final decision regarding any settlement of the case. • Pay your legal bills in a timely manner. • Don’t expect your attorney to be your friend, but friendliness is always considered a plus.